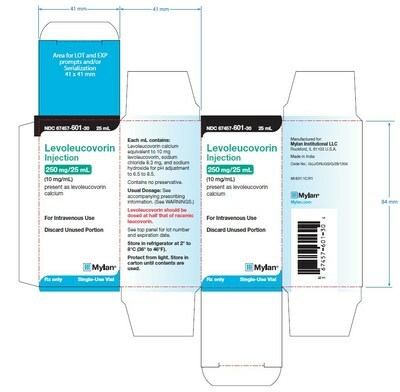 ROCKFORD, Ill., March 18, 2019 /PRNewswire/ -- Mylan Institutional LLC is conducting a voluntary nationwide recall of two lots (see table below) of Levoleucovorin Injection, 250 mg/25 mL tothe consumer/user level. The lots were manufactured by Alidac Pharmaceuticals Limited and distributed by Mylan Institutional LLC. The Levoleucovorin Injection is being recalled due to the presence of particulate matter identified as copper salts. The particulate matter was discovered during 12-month stability testing. Regular Mail or Fax: Download form www.fda.gov/MedWatch/getforms.htm or call 1-800- 332-1088 to request a reporting form, then complete and return to the address on the pre- addressed form or submit by fax to 1-800-FDA-0178.